For making difficult decisions and staying the course even when doing so was unpopular, Mikhail Gorbachev has earned his place in history. There are leaders who have presided over the renewal of their countries: Adolfo Suárez, Margaret Thatcher, Helmut Kohl, Ronald Reagan and Václav Havel. Then there are leaders who changed the world. The first among them was Vladimir Lenin, who created the communist system that challenged the West. The second was Mikhail Gorbachev, who brought that system down. 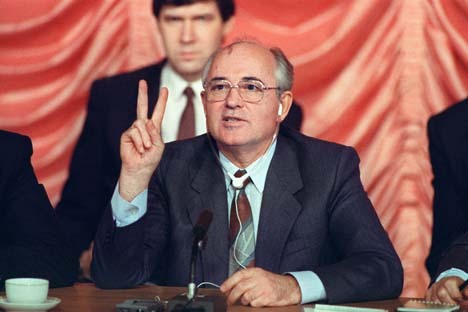 Between 1985 and 1990, Gorbachev showed that he was a different kind of leader. First, he recognized that the U.S.-Soviet arms race was futile. In 1986, Gorbachev put forward the idea of a nuclear-free world, which resulted in the Soviet-American dialogue on nuclear disarmament and the signing of a treaty on the liquidation of medium and shorter range missiles. The two opposing sides decided to destroy a whole class of weapons that could have triggered a nuclear war. This decision was followed by negotiations on strategic offensive arms reductions, cuts in conventional weapons and a ban on chemical, bacteriological and biological weapons. Gorbachev's dialogue with Ronald Reagan on security matters was not merely an admission that the Soviet Union was no longer able to compete with the United States in the nuclear arms race; a different Soviet leader could have continued playing dangerous games with the Americans for much longer. Gorbachev decided voluntarily to renounce the maintenance of the nuclear threat as a way of propping up the Soviet system. Gorbachev’s second great departure from his predecessors was his conviction that every nation was entitled to choose its government, a belief that was crucial in his decision to release Eastern Europe from the Soviet grip. When revolutions swept across East Germany, Czechoslovakia, Hungary and Poland, their leaders made frantic calls to the Kremlin pleading for help, but Gorbachev responded with a firm “No." Soviet troops were still stationed in these Eastern bloc countries, but Gorbachev did not want a repeat of the Prague Spring. His actions were crucial in reunifying the German people and returning the former Soviet satellites into the European fold. Gorbachev buried the world communist system, marking the end of the Cold War and confrontation between two hostile systems vying for world leadership. Having renounced the Communist Party’s monopoly and opened the floodgates for the freedom of expression, Gorbachev accelerated the disintegration of the Soviet Union. True, he had hoped to preserve the country as a community of allied states, but national republics were distancing themselves from Moscow much too quickly and strongly for disintegration to be stopped. Gorbachev let the Soviet Union evaporate and, probably without intending to, turned out to be a great reformer. The former Soviet president comes across as a dramatic personality first and foremost because after starting the country’s great transformation, he did not carry it through all the way to the end. He was the first man in Russian history to have left the Kremlin without clinging to power. But this is not unusual. History does not know of any reformer who managed to destroy an established system and build a new one in its place. Reformers sacrifice their popularity when they start to dismantle the old way of life, and this is true for Gorbachev. Even today, his name evokes mixed feelings in Russia. No society has ever perceived reformers as heroes during their lifetime. Great politicians are recognized for their achievements only when they pass into eternity. Mikhail Gorbachev, however, has become a monument in his lifetime. Gorbachev is history. As Thomas Carlyle said: “The history of the world is but a biography of great men.” Having assured himself a place in eternity, he remains a remarkable man with a larger-than-life personality.